One of the best things about Thanksgiving is spending time with family. Many people live far from family members and travel long distances by car, train, or plane to be with their loved ones. Thanksgiving is the busiest travel day of the year! Traditional foods are a large part of Thanksgiving celebrations. Many families include the entire family in the food preparation. Traditional foods include turkey, stuffing, gravy, sweet potatoes, cornbread, mashed potatoes, and cranberry sauce. Many people serve pie for dessert at the end of the meal. Popular pie flavors are pumpkin, pecan, sweet potato, and apple. After the feast families often do additional activities. Some like to take walks after eating such a large meal. Some people take naps. Others sit down together to play board or card games together. A ripe cranberry will bounce. All turkeys and chickens have wishbones. Canadians celebrate their own Thanksgiving every October. The first Macy’s Thanksgiving Day Parade was held in 1924. Ever wondered how you should wear your poppy? As thousands of service personnel take to the streets of the capital in the largest one-day street collection of its kind, watch this video from the Royal British Legion, which should clear up the conundrum once and for all. 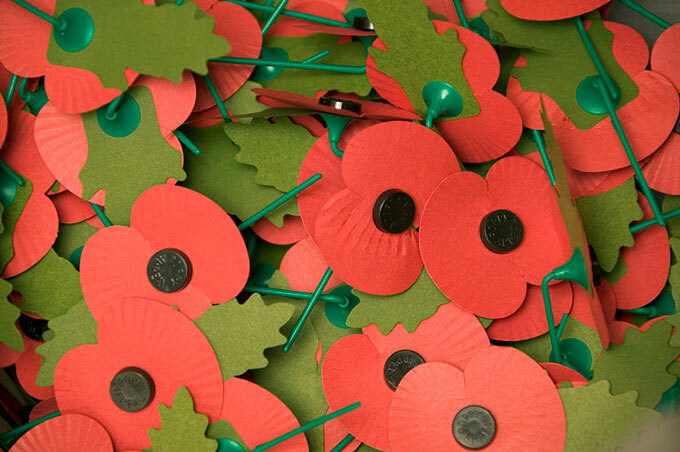 Since 1920 the Remembrance Poppy has been worn to commemorate members of the armed forces who have lost their lives in war and they are traditionally worn from the end of October until Remembrance Sunday each year. Last year this tradition was celebrated in spectacular style when a poignant exhibition Blood Swept Lands and Seas of Red saw a sea of ceramic poppies flood the Tower of London to mark the outbreak of WWI. From 7am this morning, uniformed personnel from from the Royal Navy, the Army and the RAF have been collecting donations outside 49 Tube and mainline stations in London and they will be there throughout this evening’s rush hour. Money raised goes to The Royal British Legion, a charity which looks after serving and ex-servicemen, women and their dependents who are in need, financially or otherwise. Its objectives were written in Royal Charter in 1925. There is much debate as to the ‘correct’ way to wear your poppy, but as this video from The Royal British Legion shows, the most important thing is to wear it with pride. Remember Remember the 5th of November !